This pattern is called Tilt-A-Whirl and it was designed by the very talented Amy Gibson over at Stitchery Dickory Dock. The pattern is available for purchase in her shop. 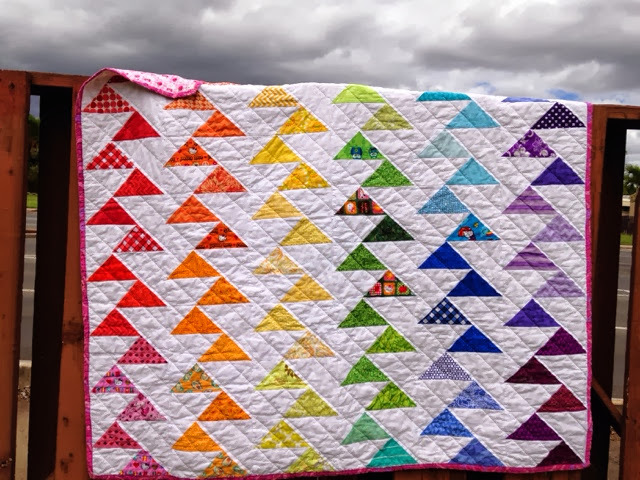 This quilt is entirely paper pieced, a technique which I adore because of the appearance of precision it gives without having to make precise cuts. It does require a lot of paper, though, so make sure your printer is in working order before attempting this one. I had a blast doodling quilting designs on paper before deciding on a flower for each colored section; a vine of leaves on the gray, a vine of flowers on the interior white, and a sort of diamond-shaped flower pattern on the white diamonds. This was a definite skill-builder. This was a gift to my grandmother and I was sad to see it go! It's one of my favorites. This is a pattern I've seen many variations on. 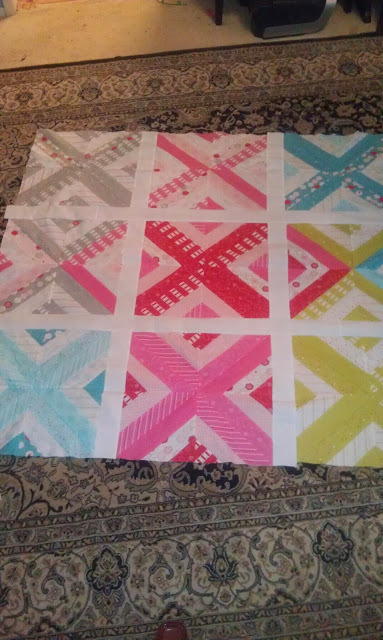 I have a few of these pinned, but I really wanted to use a jelly roll to make it easy on myself so I think mine is a little different from the existing ones out there. The fabric is Moda Sew Stitchy. After assembling rows of three and cutting them up, it was a little tricky arranging them into blocks I liked - and then I was dealing with bias edges so squaring them up was another challenge. 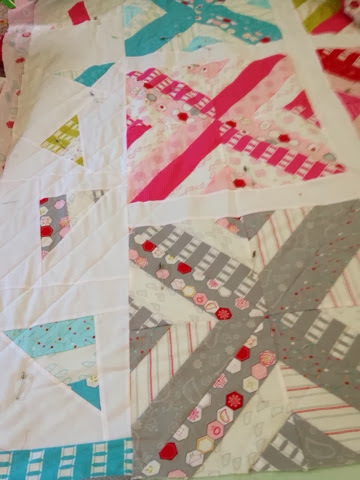 Then I really decided I wanted sashing so it wasn't so scrappy looking. 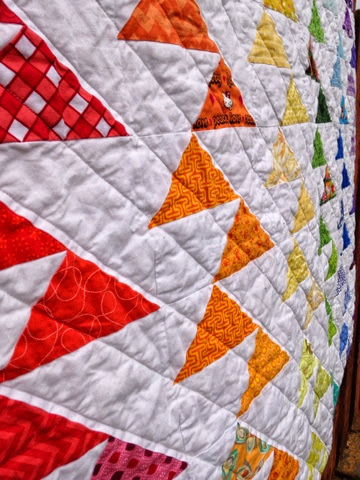 And then I went with some floating triangles at the top, on a whim. Over all I'm very happy with it and I love how it just sort of evolved as a work in progress, without any real plan from the beginning. I'll post more pictures after it's finished ... I just couldn't wait! 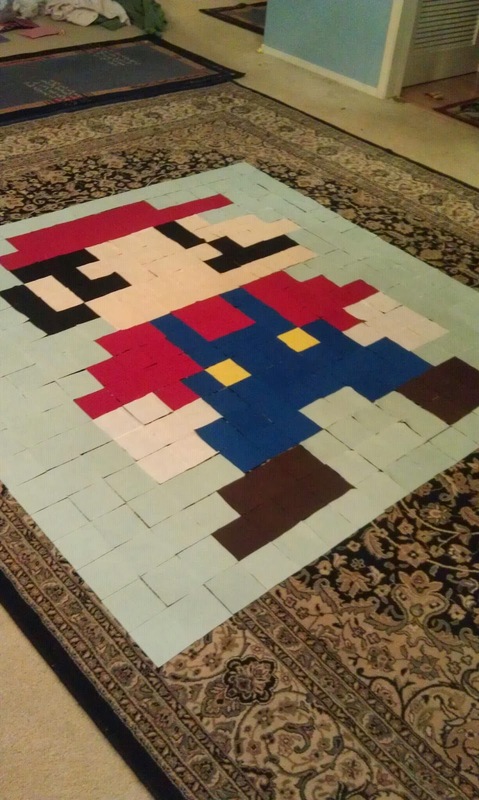 My oldest youngling was overdue for a custom quilt. I pinned several simple geometric examples and had my daughter choose from them. This was the winner. I found the pattern in a magazine. It's Cutting Edge by Fresh Lemons Quilts. 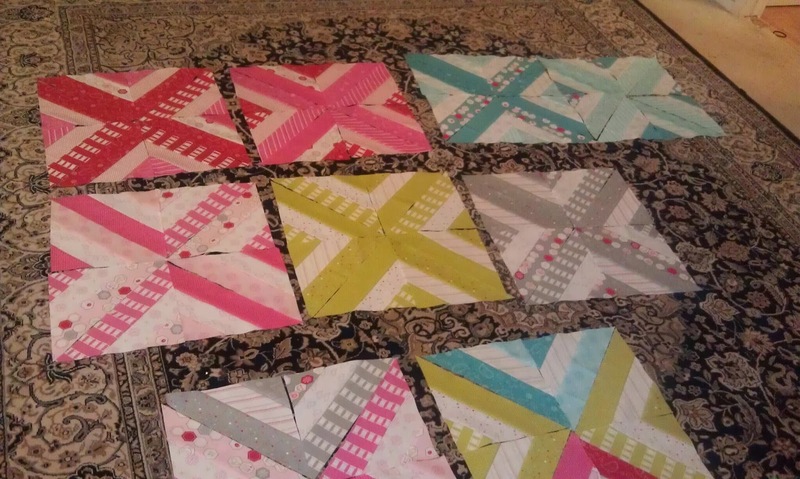 I just love paper piecing and was thrilled with the triangle layout. I agonized over color selection here. I really wanted the red column to fade down to orange, and then the red orange to fade down to yellow orange; the yellow orange down to yellow green, etc. I love how it turned out. I ordered this gorgeous bundle from Etsy and stuck a few HK prints in there from my stash. Then I decided it was just not enough Hello Kitty in there so I purchased this adorable gingham print for the back. 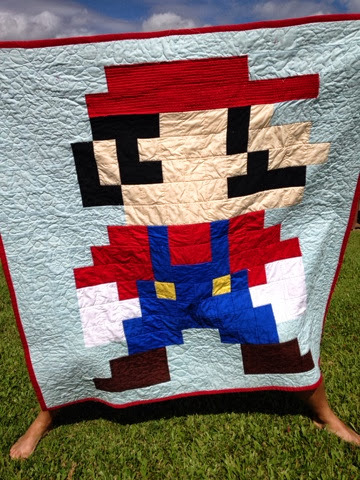 Coming straight off the Mario quilt, I was ready to go back to straight lines and the quilting went SO fast compared to Mario! I think I finished it in an hour or so. Then I used a print from my stash (Walmart I think) for the binding. She loves it :) It's probably my favorite quilt of mine so far. 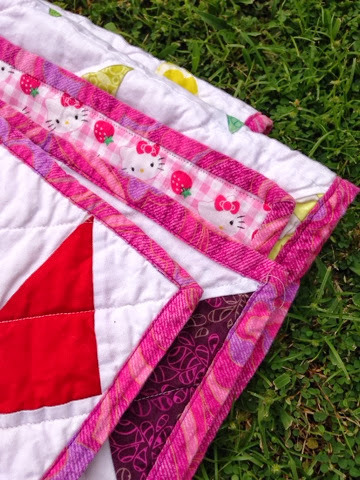 I am officially a quilter, and my youngest "toddler" is almost not anymore, so I have opted for a name change and a rebranding of sorts (including an etsy shop). Desert Rose is a china pattern that was popular in the 40s, 50s, and 60s, and my grandmother had a large collection which I inherited. 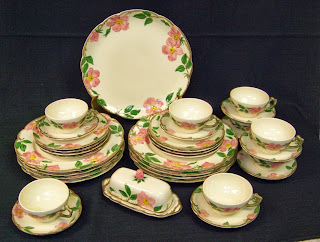 You can see it in "Gangster Squad," every antique store in the south, and in several of my food-related posts. 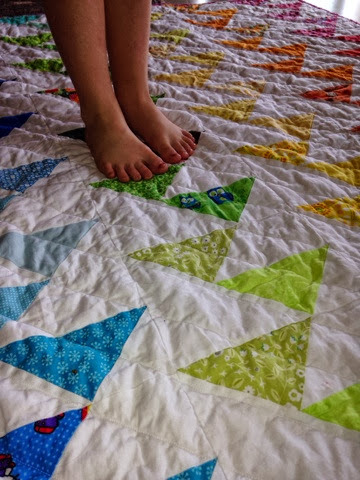 Recently my aunt sent me a quilt my grandmother started - the blocks are individually hand-quilted and it is going to be a true labor of love to finish it, an amazing heirloom I won't want to let go of. 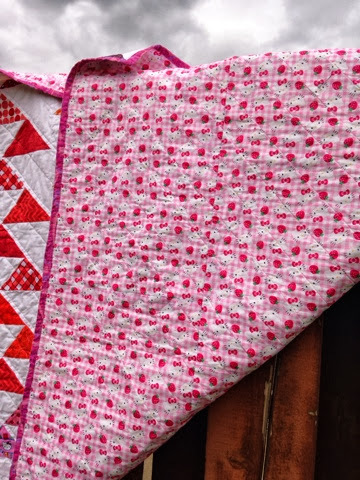 So on my fifth or sixth day of brainstorming new blog names, during dinner, it hit me :) So here it is, Desert Rose Quilts; heirlooms to last forever and create memories.